During the brief lull in Sochi between the Canadian women’s national hockey team’s prodigious comeback to claim their fourth consecutive Olympic Gold medal, and the men’s national team winning their second, Gary Clement’s comic from the 2006 Olympics was re-shared among a number of online communities; a meme that went viral throughout Canada. The comic was created after the women’s team won their second Gold in Turin, where the men’s team finished out of the medals. The image is intended as a celebration of the women’s team’s achievements, but the joke is based on an inversion and transference of the traditional, patriarchal discourses on femininity to the men’s team, who played poorly. The men are supposed to play more like the women, who are playing more like men. In this sense it feels like a reinforcement of one of an old and insidious forms of gender-bias. With this in mind the image does a disservice to the women’s team, who have not only set an impeccable standard for team dominance in Olympic competition, but who have done so through their own passion, will and sacrifice. 1998 marked the first Olympic tournament where NHL players were allowed into the competition, and provided Canada the opportunity to construct our own version of the ‘Dream Team’ for each tournament since. The men’s teams have been very successful, but not nearly as dominating as the women’s program. This is meaningful for far more than the medal count. Hockey plays a crucial role in the development of contemporary Canadian identity. It is one of the few near-universal signifiers of Canadian nationalism, one of the only ways that a country as big and diverse as Canada comes together. Spending endless hours on frozen ponds, recreating favourite moments on community rinks, and escaping the tedium of small-town life in search of fame and fortune are among the many hockey-related myths that negotiate the Canadian experience with hockey. Unfortunately, the distance between the idealized mythology of hockey and the reality is gaping, wider than ever, and it appears to be continually growing. The prohibitive costs associated with playing the game, the excessive pressure associated with competition, and the alarming lack of concern for player safety (especially in youth hockey), are among an increasing number of issues negatively affecting hockey at its grassroots, where the myths are supposed to come from. From Timbits™ children’s hockey, to the increasingly lower ages of body-checking, performance demands and scouting, all the way to the at times outlandish expectations that follow young male players into the juniors and the big leagues, the game has been thoroughly commodified and sold back to us in a cross-section of iterations. The professional men’s game today is largely lost in the media ocean that surrounds it. More and more the game itself is means less and less as it is now shaped as a content vehicle rather than as an athletic competition. Contemporary sports media has built itself exploiting the mythic connections between hockey and nation. Now, its hypercommodification of players through the incessant discussions of their ‘value’ as a measure of their point production versus salary, cap hit, and fantasy league status etc… creates a gulf between the myths that attracted people into watching and becoming fans, and the reality of what they see on TV and online day after day. The Olympics seemingly offer one of the few opportunities to remind ourselves of why we love hockey so much and feel such pride in the sport as a nation, even as we watch others compete. Not only do we get our own, homegrown all-star team, a group that appears to be playing for nothing more than the love of game and nation. The classic myth of the elite, highly-paid professional that would play for free even if there were no enormous sums of money involved is a powerful one that resonates with almost all fans. After all, we all play the sports we love without remuneration; in fact we pay to play, and can only dream of actually being paid to play. For this reason, the women’s team is embodying this myth everyday. 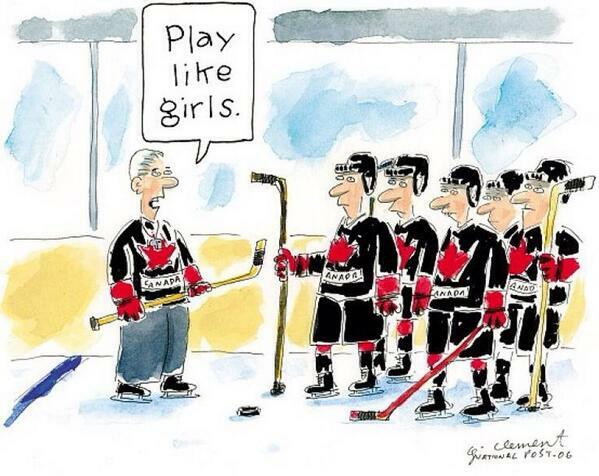 The women play, and win, for Canada, the Gold, and little else. The players leave it all on the ice, skate off as champions, and have to go back to the everyday lives and the responsibilities that allow them to play. There are no personal fortunes to be earned playing professionally, so their passion for the game is their principle motivation. If the devotion we all have as fans to hockey is negotiated through the mythic constructions surrounding the game, then the women’s team are a far more pure realization of the myth. The women are us: everyday Canadians who love to get out and play. The only difference is they’re world-class athletes who are better than most of us can ever dream of being, and they embrace the multiplicity of demands associated with their talent in one the most ambitious, unforgiving, and pressure-filled environments known to Canadians: national team hockey. The impositions on all elite, Olympic-level athletes are borderline inhuman, regardless of sport, and all deserve commendation for their efforts and sacrifices. But none deserve our reverence more than the women’s team. The success of the women’s program is unprecedented, cultivating and maintaining a level of dominance that is quickly becoming generational. Their comeback victory against the U.S. is one of the greatest triumphs in the history of Canadian sport, the overtime goal could and should be shown in an instructional video. Playing like girls is now by almost any measure the absolute gold standard for hockey, in myth, and in reality. Playing like girls connotes supremacy, greatness, and valor. Following the women’s victory over the U.S., Max Read of Deadspin wrote: “People spend their whole lives looking for something to love like Canadians love hockey.” And while this endearing statement is undoubtedly true, it is especially apposite for the women’s team. They not only play, they drive themselves to the pinnacle of excellence for their love of the game. I’m not sure there is a more powerful articulation of the relationship between myth, hockey, and Canada than that. There may not be a closer archetype of the mythic ideal of pure sport than our women’s team. 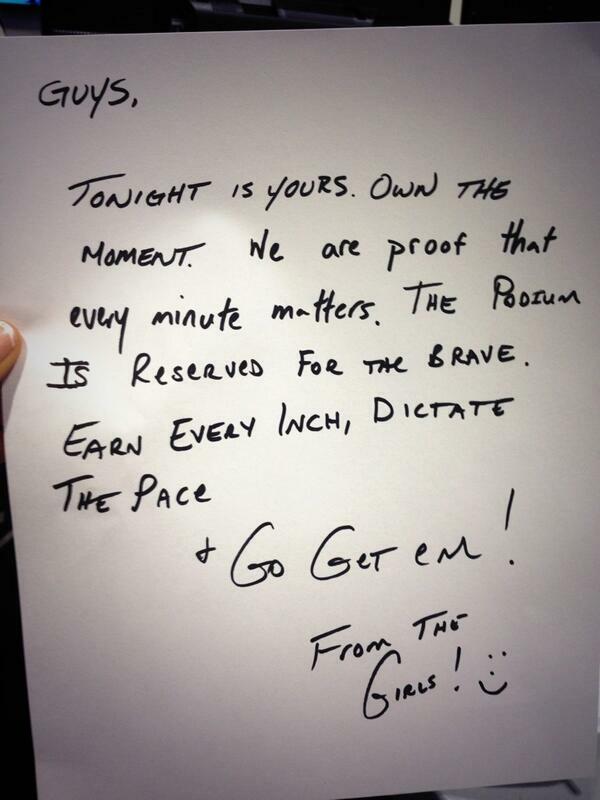 Moving forward and leading up to Pyeongchang, hopefully Clement’s comic and its second-class connotations can be left to the vestiges of Canadian hockey history in favour of a new meme: the note left by the champion women’s team for then-aspiring men’s team in advance of their semifinal matchup. Let’s work to re-appropriate contemporary hockey mythology into something more befitting for the champions who hold unimpeachable stature atop Canadian hockey. – Peter Zuurbier is a PhD student in the School of Communication at Simon Fraser University.